Walk outside and you are sure to see some grass. For many people, a lawn is the most familiar experience with grass that they have. Surprisingly, the grass family, Poaceae, is the fifth largest family of living things, and to humans, perhaps the most important. Grass includes agricultural grains such as rice, corn, wheat, oats, barley, bamboo and sugar cane. Grasses cover about 20 percent of the earth’s land. Grasses are very hardy and grow in wet marshes, dry habitats, and hot and cool climates. Grass has roots, stems, flowers and leaves, with variations and contains both male and female cells that fuse to create seeds that grow into fruit. Grass can be less than an inch long to three feet long on average but some kinds of bamboo can grow to one hundred feet! Grass is very important to the food chain. Many people, insects and animals eat grass and grass products. In addition, grasses prevent erosion, reduce urban noise and dust, filter rainwater, increase soil fertility and provide a habitat for us and for many insects and animals. Grass also cleans the air through photosynthesis. The two main types of grasslands are savannahs and temperate grasslands. Rice, sugar, corn, bamboo and cereals are all important members of the grass family. Take a close look at grass! Write a one page story as a bug in the grass. What dangers are you presented with? Who do you meet? How do you make a life for yourself? Considering the many types of grasses and the many climate zones grasses are found in, describe the type of grass and climate that you are living in. Are there certain cycles your environment goes through? Are there plants other than grass in your environment? You will need four kitchen sponges, sewing pins, ½ cup grass seed, a spray bottle and a clear container with a lid (you could reuse a container you find in your home). Design the shape of the surface your grass will grow on. Is it shaped like a house or is it a terraced garden? Rinse out the sponges and let them dry slightly. Assemble your design using sewing pins, cutting sponges if necessary. Place the structure on the upturned lid of your container. Moisten it with a spray bottle and evenly sprinkle with grass seed. Cover your design with the container, keeping it slightly ajar or poke a few holes in the container to prevent mold. Until the grass is growing well, keep it moist with the spray bottle and well lit. Regularly water your grass, trimming when you desire to enhance your design. Record how fast it grows and how often it needs water. How long can you keep your grass design alive? Did it grow well without using any fertilizer? If your grass didn’t grow well, hypothesize as to why. What does this activity imply about the needs of grass? 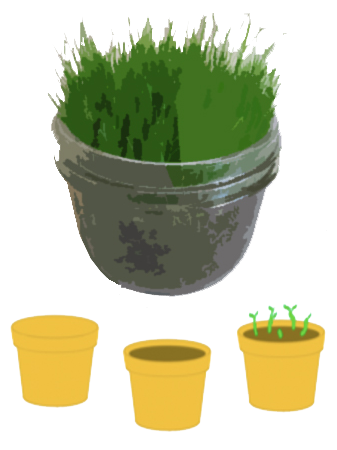 What does grass really need to grow healthy? It’s all about the grass! People have used baskets ever since they learned how to weave blades of grass together. 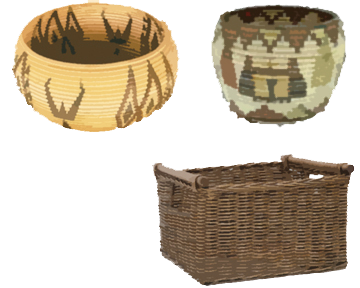 Basket constructions differ in different places and weaving forms a cultural heritage for native people. Baskets are made to hold and carry things. Baskets are mainly made through coiling (winding grass fiber and stitching it together) and splint weaving. Look at how baskets are made and select your material to be woven or coiled. Follow the steps and take your time. People who live in grasslands know that grass is not just good for eating. It is also good for living in! There are many types of grass houses around the world. Some are made from bamboo, hay and sod. Bamboo houses use bamboo poles as frames for walls, floors, stairs and railings. Cut bamboo strips are laminated and joined together into panels. The parts are moved to the site where the panels are joined to a bamboo structure. Bamboo shoots grow up to 60’ in one year! They mature in three years at which time they can be harvested and made into houses. 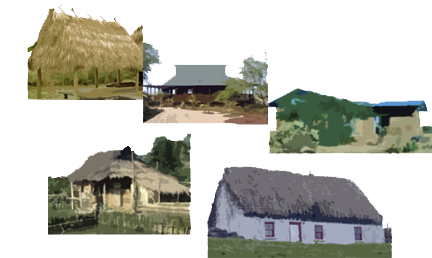 Sod houses are built where there are no trees and have big, thick walls because the sod roof is heavy. The heavy walls and roof keep the house cooler when it is hot and warmer when it is cold. Bales make straw bale houses , or blocks of cut straw tied together with wire. They are stacked on a foundation and then coated with plaster to become rigid and water proof. Don’t take grass for granted! Near the equator, you can find many temperate grasslands. Some people live in grass houses.